We are one of the leading manufacturers and suppliers of high quality Sandstone Slabs. Our product range includes wide range of sandstones slabs such as grey sandstone slabs, gardha yellow sandstone slabs, beige sandstone slabs, rainbow sandstone slabs and pink sandstone slabs. These slabs are available as per the requirement of our clients and at competitive market price. The Grey Sandstone Slabs are available in natural, honed, polished finish sandblasted and bush hammered finishes. These products are grey in color and available at competitive market price to our valuable customers. 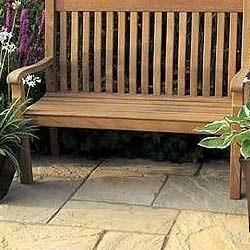 These products are manufactured using high quality sandstone that is sourced from reliable vendors. The edges of these slabs can be either hand chiseled or machine cut. These products are widely used for cladding of walls and flooring. We offer a wide range of high quality Natural Sandstone Slabs to our customers. 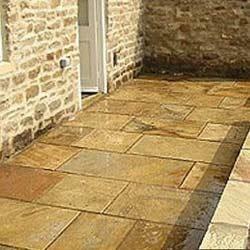 These products are manufactured using high quality sandstone, that is sourced from reliable vendors. These products are widely used for cladding of walls and flooring. These products are yellow in color and available at competitive market price to our valuable customers. These products are known for their dimensional accuracy and fine finish. 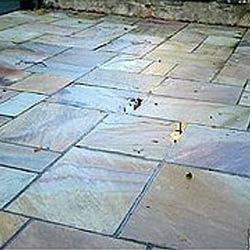 We offer a wide range of high quality Rainbow Sandstone Slabs to our customers. These products are used for cladding of walls and flooring. These tiles are available in attractive rainbow color. These slabs are available in natural, honed, polished finish sandblasted and bush hammered finishes. These products are available at very reasonable market price. 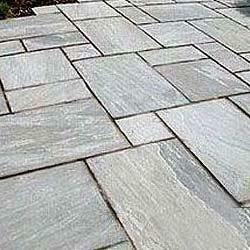 We are one of the prominent manufacturers of Grey Sandstone Slabs to our valuable customers. These products are widely used for cladding of walls and flooring. Our products are known for their accurate compositions and fine finish. These products are available at affordable market price and in grey colors. These products are available in various sizes as per the requirement of various clients. 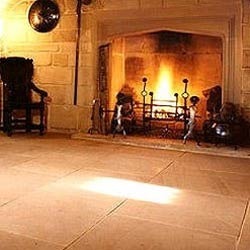 We offer a wide range of high quality Beige Sandstone Slabs to our customers. The edges of these slabs can be either hand chiseled or machine cut as per the requirement of our clients. These products are widely used for cladding of walls and flooring. These products are beige in color and available at competitive market price to our valuable customers. These slabs are available natural, honed, polished finish sandblasted and bush hammered finishes. 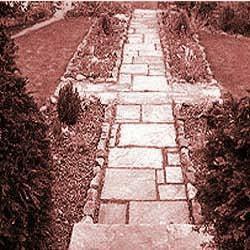 We offer a wide range of high quality Pink Sandstone Slabs to our customers. These slabs are available in natural, honed, polished finish sandblasted and bush hammered finishes. These products are widely used for cladding of walls and flooring. The edges of these slabs can be either hand chiseled or machine cut. These slabs are available in pink colour at competitive market price to our valuable customers. These products are known for their dimensional accuracy and fine finish. Looking for Sandstone Slabs ?